His alarm blazes Sweet Home Alabama every morning at 5:30 am. He is so quick to turn it off that I rarely wake to hear it. 45 minutes later his old blue and silver GMC truck rumbles to life. The dog, hearing the engine, pulls himself up from his place by the fire and trots out the door. His short coat hardly keeps him warm in the frigid morning air and he quickly hops in the back of the truck. As his master scrapes the ice off the windshield he wriggles into the center of a pile of old blankets and falls back to sleep. His master climbs in and the truck rambles off into the mist. Their food tastes awful and they never get the order right, ever. The sausage and egg croissants he is eating everyday are going to give him a heart attack. I had to figure out a way to fix this. There is no way we can afford $120 in sausage croissants every month. I found out there is a microwave available at his work so I fashioned my own Breakfast Muffins. Each muffin is individually wrapped in plastic wrap and aluminum foil then frozen. a glug of milk (about a couple tablespoons, but I never measure) = cost is a couple pennies. Total Cost= $1.54 per sandwich and that is with quality eggs, sausage and cheese. 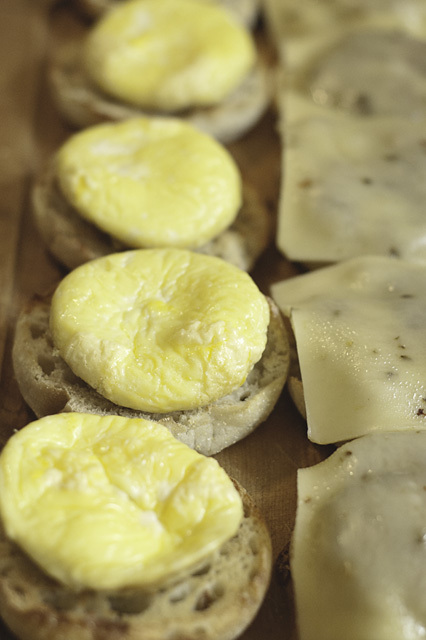 You could lower that cost to $1.37 per sandwich by slicing your own cheddar cheese and using non organic eggs. Personally I would pay the extra .17 cents for better quality food, but I know many people, including myself a couple years ago, who can’t spare .17 cents a day. 1. 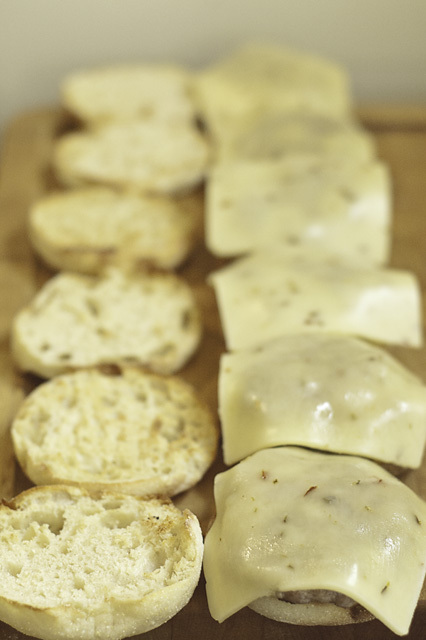 Preheat the oven to 325 F. Begin toasting the English muffins in batches, using a toaster or toaster oven. When they are done allow to cool. 2. 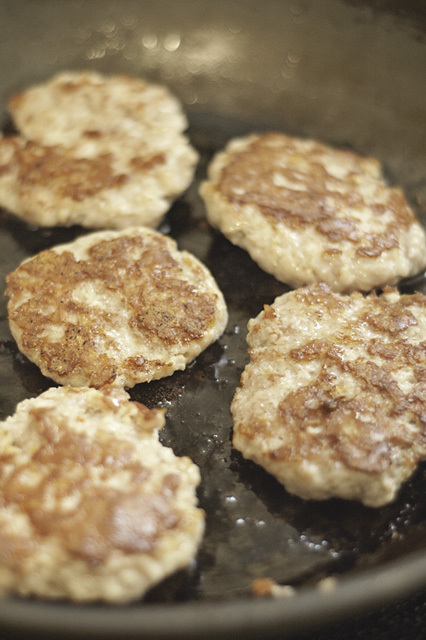 While the muffins are toasting form the sausage into 6 patties and heat a large skillet on medium heat. When the pan is hot, place as many of the sausage patties on the bottom of the pan as you can while making sure they do not touch. 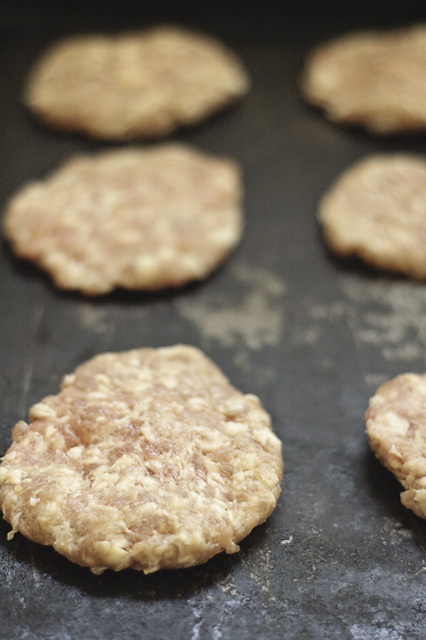 Cook the patties for about 5 minutes on each side or until cooked through. Remove from pan and drain on paper towels. 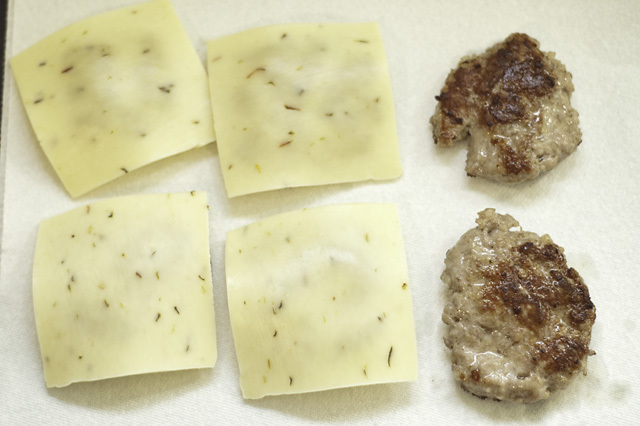 Place a slice of cheese on each patty to melt. Allow to cool completely. 2. While the sausage cooks, crack 6 eggs in a bowl and add a couple tablespoons of milk. Whisk together until well mixed. Using a ladle divide evenly into 6 well greased muffin cups. Bake for about (10 minutes?) then remove from oven and allow to cool completely. Remove from tin. 3. 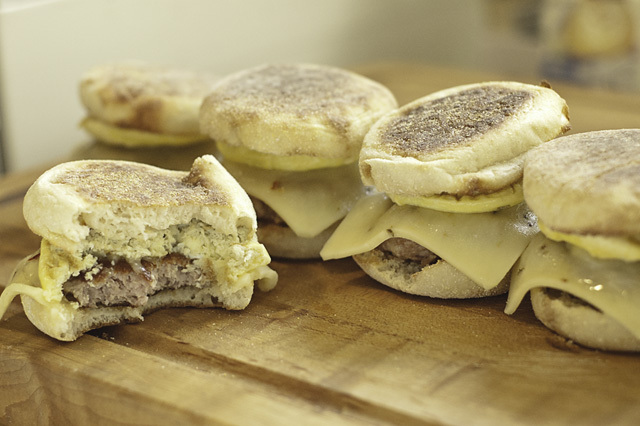 Assemble the sandwiches in the following order: half an English muffin on the bottom, then the sausage and cheese and finally the egg and the other half of the muffin on top. Wrap each sandwich tightly in plastic wrap then again in aluminum foil. Store sandwiches in the freezer in a zip top freezer bag. 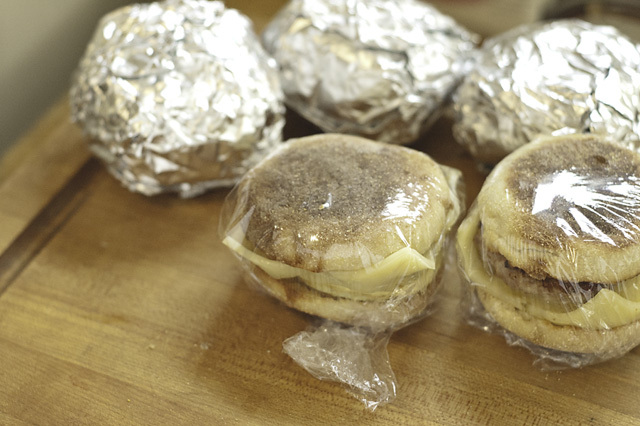 Reheat the sandwiches in a microwave or toaster oven until piping hot. All microwaves vary considerably so its hard for me to give you an exact time for reheating. 3-5 minutes should do it, but use your best judgement. This is a FABULOUS idea…..!!! 🙂 Copying to commence shortly over here in this kitchen…. Thank you! Let me know how they work out! I made them this morning, and LOVE the egg portions best. 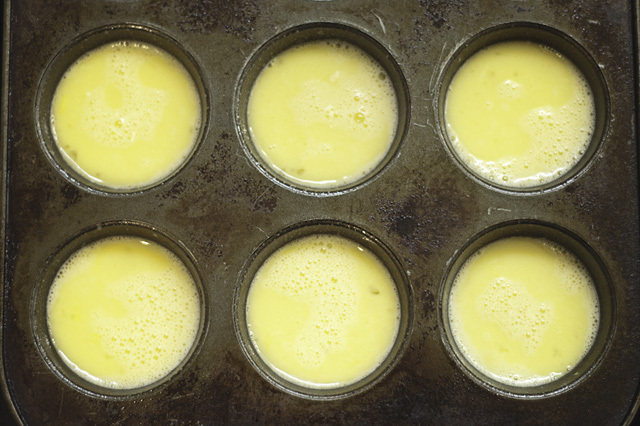 I would have never thought of baking eggs in a muffin form, but it is perfect for that! I forgot to buy English Muffins, so I made a batch of baking powder biscuits……we’ll see how that holds up in freezing/heating. I let the biscuits bake a little longer to “toast” them 😉 and give them a little more firmness. 15 in the freezer right now. I’m excited!! Am going to try again with English Muffins….. Awesome! Glad they worked for you too! Yummy! Now if you can figure out how to make that horrible for you deep fried potato thing…. Wow – I’d never have thought of making these myself, but what a great idea, especially the freezing part. I’ll have to put this on my to do list because I never have any bread at home for the weekend and either skip breakfast or have porridge. Knowing these are waiting in the freezer would make for a happy Sunday morning! How about reheating them in the oven because I don’t have a microwave – do you think that would work? I think the oven would be great. I love my toaster oven for heating small stuff like that. I just made these for my boyfriend and I. Muffin pan, who knew? Great idea!